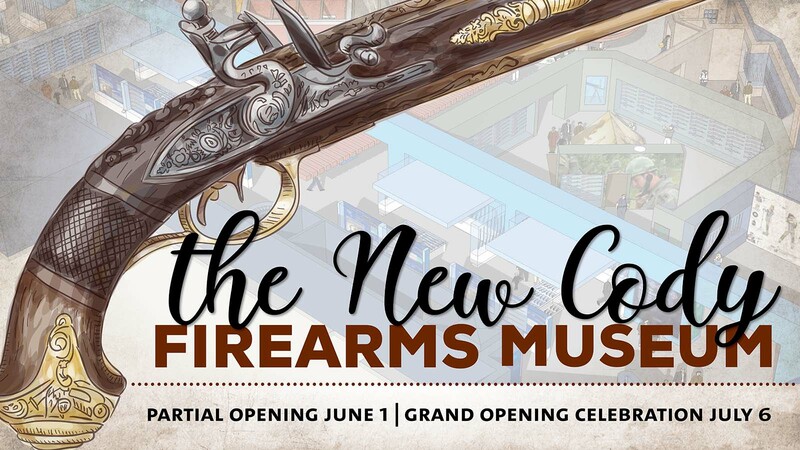 Grand Opening of the NEW Cody Firearms Museum, July 6, 2019, 4 p.m.
After a full-scale renovation and complete redesign, the Buffalo Bill Center of the West’s Cody Firearms Museum celebrates its Grand Opening on Saturday, July 6 from 4–6 p.m. Free admission begins at 4 p.m. that day. Join us for this event to see the absolutely complete, two-floor museum. The renovated museum will exhibit more firearms than currently on display and feature a more interpretive experience for all museum visitors. The new galleries include the evolution of the firearm, military history, western history, modern shooting sports, and embellished arms. The front of the museum is dedicated to an orientation experience for people unfamiliar or newer to firearms. There, they can learn basic principles, including safety. Throughout the museum, several educational simulators are available to enhance the visitor experience. And for collectors and enthusiasts, the museum design features technical and comprehensive displays of firearms, not only arranged historically, but also by manufacturer. A partial opening for the Cody Firearms Museum is June 1, but some areas and details may still be in progress. All will be fully complete in time for the July 6 Grand Opening.